Glorious Gay Days: Where's the love? This Chick-fil-a drama won't stop. It hurts me to see so many people rallying behind a company that hates gay people. And it's completely, totally misguided to say that this is about "free speech." 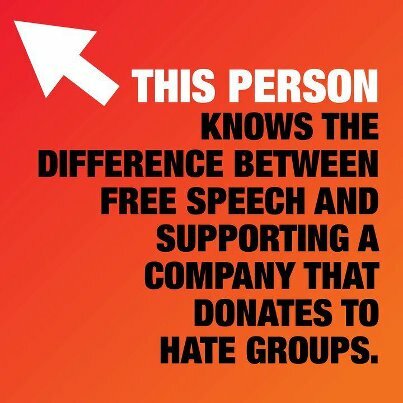 This has NOTHING to do with free speech. These people are rallying behind Chick-fil-a because they agree with the Cathy family value that gay people are less than (not equal to) straight people. Think about it. It's all about the content of what the Cathy family is saying. This has NOTHING to do with their right to say it. Being gay isn't something you do. It's who you are. Gay is not an action. It's not a choice. When did you choose to be straight? Do you remember the first time you knew you were heterosexual? Those are silly questions, right? It's silly when people ask me when I first knew I was gay too. This gives me tired head, because it's clear to me that a large group of people are supporting hate. They are supporting the Cathy family's hatred of homosexuals. I'm gay. My husband's gay. Because we're gay we're in a minority group, and it makes me sad and uncomfortable to see a majority being hateful. Labels: Gay Bucks, Gay Rights Are Human Rights, WWJD? I know, I know. It hurts so much that you have to deal with this, but not as much as it hurts you TO DEAL with this. Where is the love indeed? No worries. We can handle any thing this world throws at us. "One day" this fight will all seem so silly. At one time white people could own black people, and at one time white people couldn't marry black people, etc. Seems ridiculous nowadays, but at one time it was normal. "One day" it will seem ridiculous that I couldn't marry the person I love. I'm certain.